Do you want your visitors to be able to choose to donate to your nonprofit as they’re filling out a form? 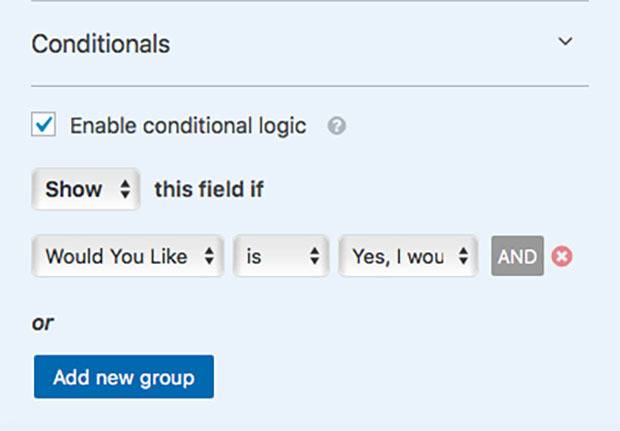 Using conditional logic, you can hide fields unless the user chooses a certain option. In this article, we’ll walk you through how to add optional payment to your WordPress form. Also, you’ll need to have a form created. See our tutorial on How to Create a Simple Contact Form as an example to get started. You can use any kind of form, but for this tutorial we’ll be using a contact form. The default contact form comes with Name, Email, and Comment or Message fields. 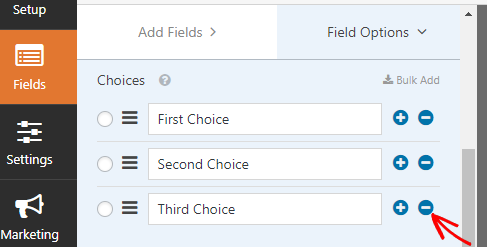 We need to add the Multiple Choice, Credit Card, and Single Item fields to the form. The Multiple Choice field comes with three choices but you only need two choices for optional payment. You can simply remove the third choice by clicking on the field in the right panel to edit and then deleting the third choice in the left panel. Since you’ll going to be asking your visitors if they would like to donate, it’ll be a good idea to change the labels for the multiple choice. You can do so by simply clicking on the multiple choice field in the right panel to edit and changing the labels in the left panel. 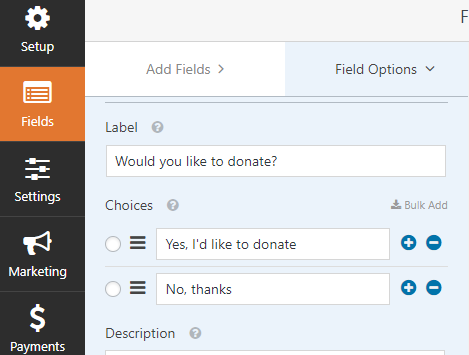 The Single Item field needs to be set to User Defined so users can enter in their own donation amount. 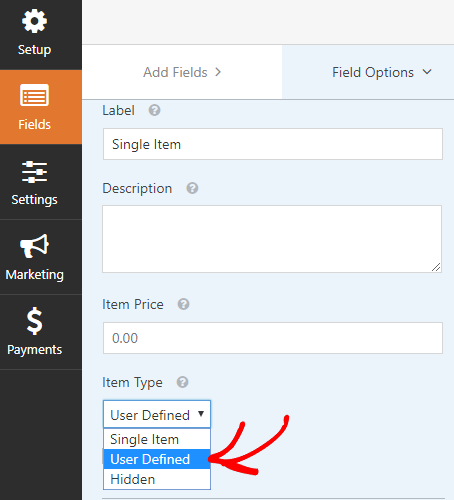 You can do this by configuring the advanced settings for the Single Item field. If you need help customizing the donation amounts, you can read this article on how to create a donation form with multiple amounts. To add optional payment to your form you first need to enable conditional logic. You can enable it by clicking Credit Card » Conditionals » Enable Conditional Logic. Once you have enabled conditional logic, you’ll need to configure the settings of when you want the payment option to show up for your users. For a nonprofit donation, you want the payment field to only show up when the user clicks “Yes, I want to donate”. Lastly, you need to connect to your payment provider by clicking on the “Payments” tab on the left side. WPForms integrates with both PayPal or Stripe for accepting payments. You can even use set up your form to allow users to choose a payment method. In this example, we will set up PayPal to process orders. To do this, you first need to install and activate the PayPal addon. Simply go to WPForms » Addons and click on the install button for PayPal Addon. Once activated, you need to return to your form to configure the PayPal settings. You need to enter your PayPal email address, make sure the mode is in Production and adjust other settings as needed. After you are done configuring the order form settings, click Save to store your changes and your form is ready to be published on your site. That’s it! You’ve just added optional payment to your WordPress form. Want to accept payment for the online orders? Check out how to process payments with your WordPress orders forms. If you’re looking to save even more time processing online orders, you can check out our tutorial on how to generate FreshBooks invoices automatically from your order form, or create a client booking form that connects with your calendar software. How can I export information on paypal form. I need the status field information. Trying to build report with exported information, I export now and no status field. I apologize for any trouble with this, and the reason that we don’t include this information in CSV exports is that it’s generated dynamically (pulled from PayPal so that you see the latest/most correct info). I can understand why this and the other PayPal-related data would be useful to export, though, and I’ve added that to our feature request to be considered down the road. If we can assist in any other way, please get in touch! Is this possible to integrate payment gateway other than PayPal or stripe in wpforms? In india both the gateways are not popular. We currently only have payment integrations with Stripe and PayPal, and aren’t planning to expand this in the near future. But if you could please share any options that you were hoping for over in our feature request form, that will help us to keep additional ideas in mind down the road.